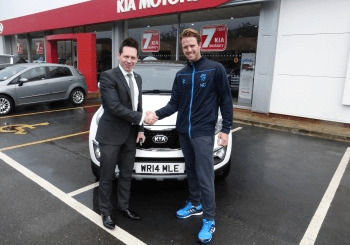 In preparation for the 2014 cricket season Howards Kia have handed the keys to a brand new Kia Sportage 2.0 CRDi KX3 to cricketer Nick Compton which he recently arrived to our dealership in Weston-Super-Mare to come and pick up. Nick is a professional cricket player who is a batsman for Somerset County Cricket Club; he has also made several appearances for the England international team. Upon finishing his A-levels he moved straight to join Middlesex making his first team debut at the end of season 2001 and staying until the 2009 season when he moved to his current team Somerset. Since then he has enjoyed several years of success consistently being a top scorer over several prolific seasons whilst also last year being named as one of the five Wisden Cricketers of the Year. The vehicle we supplied Nick with was a Kia Sportage 2.0 CRDi KX3 which is a strong performance vehicle with low running costs. The 5 seater diesel-powered 4x4 is the perfect car for Nick to get to training and games as it offers a large boot space and interior for all of his cricket gear. Howards Kia is a Weston-super-Mare based dealership showcasing the latest new Kia models, together with a full forecourt of used vehicles and a full aftersales service facility. Our dealership is open 7 days a week, so why not visit our dealership and take a look at the great new and used vehicles we have to offer. Alternatively, feel free to give us a call on 01934 332700. We are delighted that Nick has chosen the new Kia Sportage and we wish him the best of luck for the upcoming season!